DeBeau had started out in Durango, Colorado when he was adopted by some freshman girls at Ft. Lewis College. They hadn't realized that they were not allowed to keep pets in the dorm and they had to find him a new home. Through a series of events the cat ended up being transported hundreds of miles to the other side of the state to end up in Boulder, Colorado, living next door to the Clarks. He had been deposited in the home where another cat already lived and was apparently not terribly happy about that. He was a friendly and fearless cat who thought nothing of wandering through any open door. "All of the neighbors were visited," Judy recalls. The Clarks found themselves in a battle to keep DeBeau out of their house. They tried to explain to the cat that there was a big dog inside but he didn't seem to listen. Finally Judy turned to Fred and said that they might as well let him in and have Jake sort him out. So they opened the door. 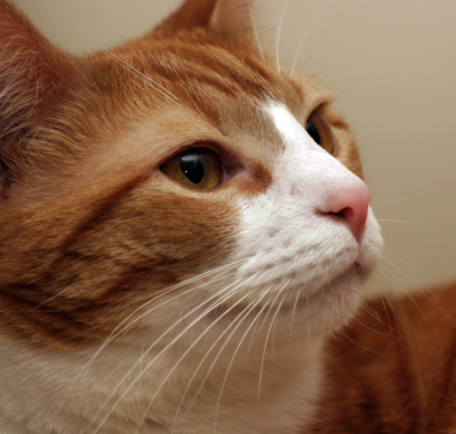 A Cat like DeBeau (Photo by Sleddog116/Creative Commons via Wikimedia)The plan didn't exactly work out. DeBeau strolled in and the next thing they knew he had curled up on Jake's front paws and Jake was looking at them like he was saying "Now what do I do with this?" Fred would get up every morning at 5:30 to take Jake out to go for a run up and down the hill they lived on, and to take care of necessary business. DeBeau took to following along and would sit with Fred as he threw the ball for Jake to fetch. Little by little the cat grew on Fred. Before too long Jake was waking Fred up at 4:30 wanting to go out. It was a puzzle until they realized that the cat had taken to sleeping on their covered deck and he got cold in the wee hours. He would move around and meow. Jake would hear his new little buddy out there. Thus Fred was woken up so that Jake could go out to check on DeBeau. Now DeBeau did not get along with the cat that already inhabited his new home. One day Jake chased the cat up and tree (where he thought all cats should be) then he and DeBeau sat below the branches looking up at the scaredy-cat. DeBeau apparently couldn't understand what the other cat's problem was. Like, why would anyone run from a dog? 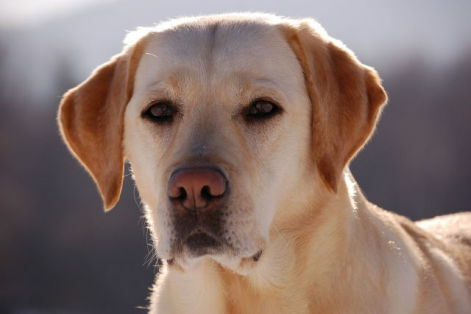 Little by little DeBeau continued to insinuate himself in their lives -- sleeping in the house, eating dog food, and A Dog like Jake (Public Domain Image)just hanging around all the time. He had also managed to work his way into their hearts. By the time they had sold their house and were ready to move to another city nearby, they realized that they needed to take the cat with them -- for Jake -- yeah, that was it, for Jake. To their dismay they realized that what people said was true -- you don't adopt a cat, a cat adopts you. And they had been adopted without their even realizing it until the deal was done. With the permission of the neighbors, DeBeau moved with the Clarks. Now he was properly their cat and he knew it. He ran the house as much as he could. When Jake would be snoozing on his dog bed, DeBeau would come and curl up with him and keep scooting closer and closer until Jake would get up and leave. Then DeBeau would have the bed all to himself -- and Judy would swear that that had been his plan all along. In the new neighborhood there was no hill, so Fred and Jake would go for walks in the mornings. DeBeau would always go along with them. No doubt he thought he was taking Fred and Jake for their walk. The new neighbors would point and tell Fred that there was a cat following them. 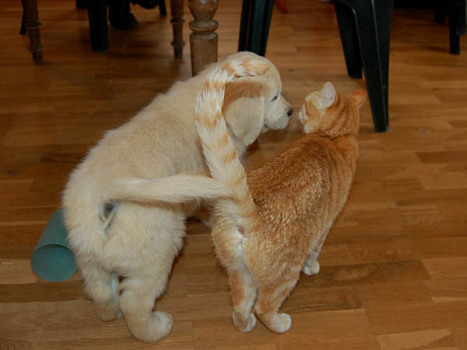 He would have to stop and explain the relationship between cat and dog until people got used to the sight. One day, after many years, DeBeau was witness to Jake having his first seizure on that bed and the cat never went near the bed again. Jake was diagnosed with a brain tumor. He eventually passed away in 2008 as an old dog. DeBeau passed in 2011 of cancer. It was the end of a beautiful friendship. I have known the entire Clark family for nearly 20 years, including Jake and DeBeau. Unfortunately they were unable to find photos of the pair for me. The pictures included here are a close approximation.